FosterEd, an initiative of the National Center for Youth Law, partners with local education, child welfare and judicial agencies to improve the educational outcomes of children and youth in foster care by ensuring each is supported by an educational champion and strengthened by an education team. The lessons learned on the ground in our pilot projects inform our policy efforts to facilitate interagency collaborations that will better serve foster children. Are much more likely to change schools during the school year (32 percent changed schools at least once). Are much less likely to achieve proficiency (only 29 percent were proficient for their grade level in English language arts and 37 percent were proficient in math). Are three times as likely to drop out of high school (8 percent dropped out during the year). Have the lowest graduate rate of any student subgroup (58 percent of 12th graders graduated) . The consequences of these poor outcomes persist even after foster youth “age out” of the child welfare system. Without educational success, they are ill equipped to support themselves. The cost to these children and society is extraordinary: over 22 percent of former foster children experience homelessness, 25 percent spend time incarcerated, 17 percent receive public assistance and unemployment rates top 50 percent. 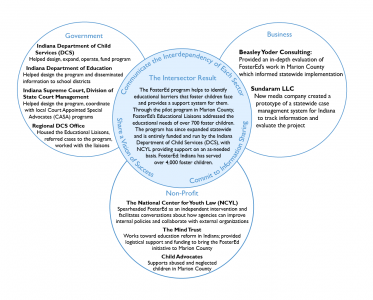 FosterEd’s Marion County, Indiana pilot program – profiled in this case study from The Intersector Project – now operates statewide as a publicly funded program of the Indiana Department of Child Services. The program began as a privately funded county initiative, illustrating FosterEd’s strategy of modeling success to spur a public sector statewide implementation that will ensure the sustainability of the program. Thirteen education liaisons work to support students across the state. FosterEd launched a California pilot program in Santa Cruz County in early 2013. The pilot recently reached an important milestone: FosterEd now serves all existing child welfare cases in Santa Cruz County within the eligible population (school-age children and youth who are dependents of Santa Cruz County and reside within the county), with the exception of a few cases of students with no unmet educational needs. Now, FosterEd: Santa Cruz County and our partners are actively engaged in efforts to secure sustainable local funding to maintain the project over the long term. In a truly collaborative local effort, FosterEd is working with the county child welfare agency, County Office of Education, and individual school districts to determine the contours of the sustainability plan. This is a prime illustration of FosterEd’s model, which ensures that local leadership and stakeholders collaborate at all phases of the project, from design, through implementation, to long-term sustainability. Building on previous work in California, FosterEd will expand to Oakland Unified School District (OUSD) to help facilitate educational teaming and planning for foster youth in Oakland schools. Like the Santa Cruz program, the OUSD partnership will create educational teams for students in care, work with the teams to set educational goals for students, and track progress toward those goals and communicate about the child’s education through Goalbook, a secure, online educational case management and communication tool. The OUSD pilot, slated to begin in January 2015, will dovetail with implementation of California’s new Local Control Funding Formula – landmark legislation that holds school districts accountable for the educational outcomes of foster youth. FosterEd has used lessons learned in our pilot sites to inform our state-level policy work. For example, the pilot programs in Indiana, and now in California and Arizona, have shown the importance of local interagency teaming, planning and collaboration to improve the educational outcomes of students in foster care. In California, work is currently underway to promote increased collaboration among school districts, county offices of education, child welfare agencies and probation offices to support implementation of the provisions of the Local Control Funding Formula specific to foster youth. It is the hope of FosterEd that this approach is promoted across California so that all foster youth benefit from the work. In early 2014, FosterEd launched another pilot program in Pima County, Arizona. Through the end of August 2014, 187 foster children had been served by the program. Both the Pima County and Santa Cruz County teams have also developed volunteer programs that train volunteers to support educational champions for foster children or to serve as educational champions themselves. Finally, FosterEd is in the process of expanding its work into Los Angeles County, where nearly one-third of California’s foster children are enrolled in school, and is exploring the possibility of establishing an education liaison program in New Mexico in 2015. FosterEd has also been contacted by several counties and states that are interested in developing projects to improve the educational outcomes of students in foster care. As part of our effort to share what we are learning and promote best practices, we have developed a toolkit to aid other jurisdictions in project planning as well as in implementing our core programmatic components: identifying education strengths and needs, developing education case plans, identifying and supporting educational champions, and forming and facilitating education teams. We are working with our partners and hope to release the toolkit online in early 2015. 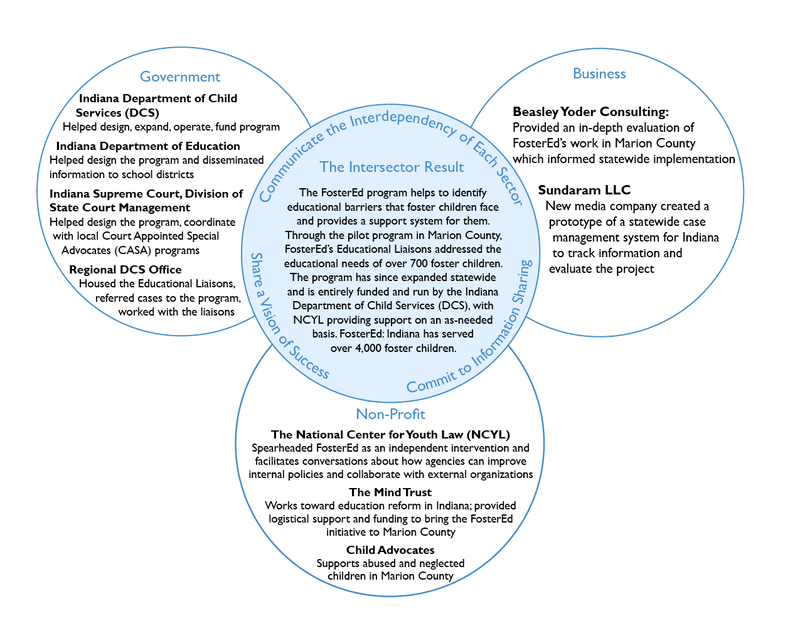 Author: A version of this post from FosterEd, an initiative of the National Center for Youth Law and subject of an Intersector Project case study, originally appeared on The Intersector Project blog and is published here with permission.